iMacs are really great for a lot of reasons, but one of their biggest downsides is that, by design, they're not easily upgradable. 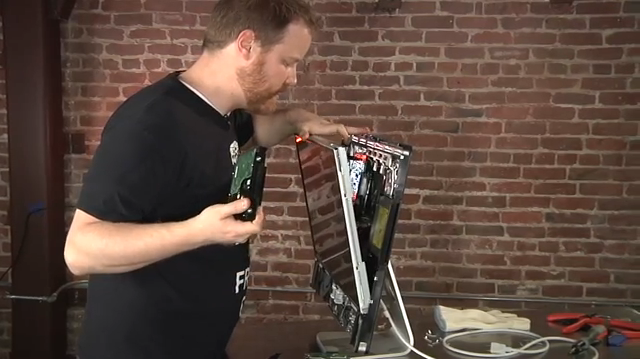 Tech blog Tested shows us how to get inside your iMac and replace the hard drive. While we'd recommend buying a Mac Pro or building a Hackintosh if you want an upgradable computer, there are many reasons you may opt to buy an iMac (or you may be stuck with one you've already got). If you need to upgrade your drive — whether you're replacing a broken drive, installing a bigger drive, or switching to an SSD, you're in for a bit of work. You'll not only need a few different types of Phillips and Torx screwdrivers, but you'll need some serious guts — this isn't a mod for the faint of heart. Hit the link to check out the video and see how its done.